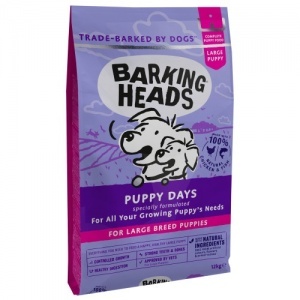 Large Breed Puppy from Barking Heads is a delicious large breed puppy food. Contains 50% chicken and salmon combined. A balanced calcium and phosphorous level for strong bones, an optimised protein and fat level for healthy balanced growth, and DHA to support learning and brain development. Barking Heads Large Breed Puppy is balanced, nutritious and super-tasty with a whopping 50% chicken and salmon. It also has limited calcium and phosphorus which helps regulate the speed of a puppy’s growth. It contains dried egg which has a great mix of high-quality protein and fat and a varied selection of vitamins and minerals.